The preparative aspects of three different, but overlapping research programs are reviewed. Silane monolayers prepared using monofunctional silanes and random covalent attachment reactions are described that implicate molecular topography and flexibility as important issues in wetting. Surfaces prepared using multifunctional methylchlorosilanes are discussed. Samples similar to those prepared in the 1940s are shown to be the most hydrophobic (superhydrophobic) ever prepared. The chemical reactions of linear trimethylsilyl-terminated polydimethylsiloxanes with the surface of oxidized silicon are described. These reactions lead to covalently attached polydimethylsiloxane polymer chains and to hydrophobized inorganic surfaces. 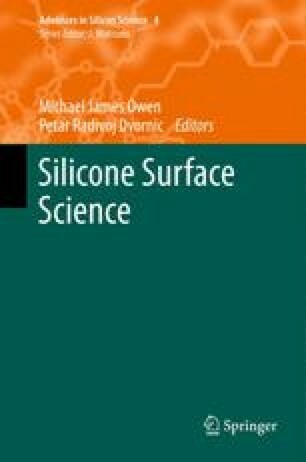 Linear silicones of this type (silicone oils) are generally not considered to be reactive with inorganic oxide surfaces. We thank the Materials Research Science and Engineering Center (DMR-0213695) and Center for Hierarchical Manufacturing (CMMI-0531171) at the University of Massachusetts for support as well as 3M, Henkel, and Shocking Technologies for unrestricted funding. We also acknowledge the American Chemical Society for permission to reproduce figures.